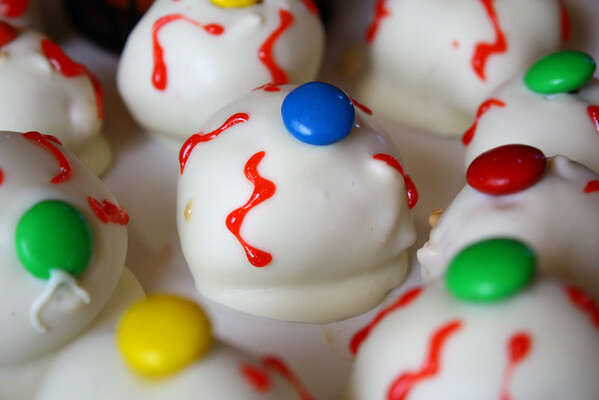 Grand Marnier Brownie Bites dressed for Halloween! Change the sprinkle color and you have an excellent Christmas, Hanukkah, or New Years treat. Every neighborhood needs that special person who brings those of us who are a little more reserved out of our doldrum ways to celebrate Halloween in a big way. For us, that special person is Claudine. The first time she sent out invites for a costume party many of us were not so thrilled to dress up. A few of us may even have looked at it as a bit of an inconvenience. However, over the years us party goers have come to not only embraced this annual event, but to begin planning for it months in advance. Last nights event was no different. Arriving at her house I entered a new world... cobwebs and spooky photos (think Harry Potter) decorated the walls, black netting hung from the ceiling, the movie Poltergeist flashed on a high wall, and a brew of Black Vodka bubbled away in a decanter next to a plate of white chocolate covered eyeballs. In attendance were Lady Gaga, Paris Hilton in prison garb, vampires Bella and Edward, Dorthy and the Cowardly Lion, a Chilean Miner and his mistress (the wife of the couple was the miner, the husband made a "lovely" mistress! ), a magician and his assistant, assorted Top Gun crew and a pair of really tacky Hawaiian tourists. Hours of work had gone into the decorations and food prep for this elaborate event with our contribution adding a fairly large number of calories to the table. White Chocolate Covered Peanut Butter Butterfinger Eyeballs (courtesy of a last minute suggestion from Joe at Culinary in the Desert), vanilla and almond flavored Bony Finger Cookies and a decadent plate of Grand Marnier Brownie Bites (I've blogged about them before, but they are worthy of another mention!) added to the spooky flair. 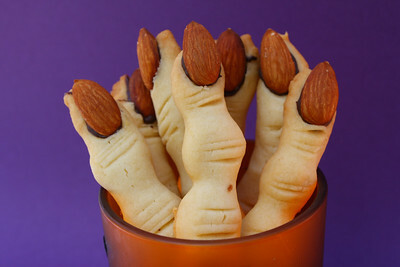 A simple butter cookie dough flavored with almond and vanilla flavors provided the base for our Bony Witch's Fingers. Rolled into finger shapes with little cuts along the knuckles for a realistic look and finished with a whole almond attached with a dab of melted chocolate, the fingers were laid over a bed of candy corn and drew quite a few comments from the party goers. Even my 14 year old son gave an appropriate "EEwww! Those really look awful!" comment as he helped fill the plates. 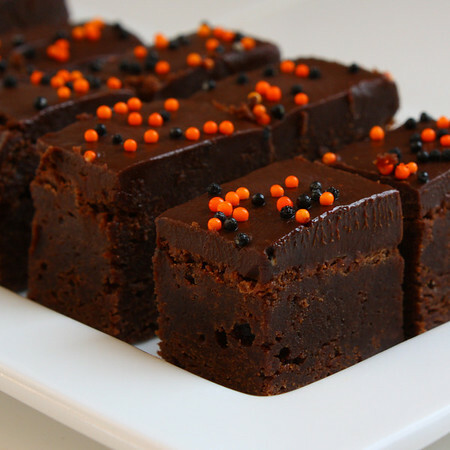 Our third and most decadent contribution is an old favorite, Halloween decorated Grand Marnier Brownie Bites. I've written about these once before, but they are worthy of another mention. Deep, rich, orange scented brownies are topped with a luscious layer of Grand Marnier enhanced ganache and would be an excellent addition to your Christmas or New Years festivities. Cut into small bites they make a lovely addition to any table and will most certainly draw that oft hoped for look of extreme pleasure and more groans of satisfaction as your guests enjoy them. Truly a treat for a special occasion. Once again, a special thanks is extended to our Party Mama, Claudine - oops... I mean Lady Gaga! Thanks for getting us all out of our comfort zone and into the party mode with another amazing evening. I'm already planning for next year! In a large mixing bowl, combine peanut butter and butter until thoroughly combined. Add confectioners' sugar and mix until combined - it will be a bit dry at first, but it will come together. Stir in chopped Butterfingers. Shape the dough into 1" round balls and place on parchment lined baking sheets. Place in the freezer to chill for at least 1 hour. Better yet, place the peanut butter balls on two plate and only remove one at a time to dip. Preheat oven to 325 degrees F (165 degrees C). Lightly grease baking sheets or line with silicone liner. Remove dough from refrigerator in small amounts. Using a generous 1 teaspoon of dough roll between your fingers and shape into a thin finger-shaped cookie. Press one almond into one end of each cookie to give the appearance of a long fingernail. Squeeze cookie near the tip and again near the center of each to give the impression of knuckles. You can also cut into the dough with a sharp knife at the same points to help give a more finger-like appearance. Arrange the shaped cookies on the baking sheets. Bake in the preheated oven until the cookies are slightly golden in color, about 20 minutes. When cooled, remove the almond from the end of each cookie; dab a small amount of melted chocolate into the cavity; replace the almond causing the chocolate to ooze out around the tip of the cookie. Preheat oven to 325°F. Line 8x8-inch metal baking pan with foil. Melt unsweetened chocolate and unsalted butter in heavy medium saucepan over low heat, stirring until smooth; cool slightly. Whisk sugar, grated orange peel, vanilla extract and salt in a large bowl. Add slightly cooled chocolate to the sugar mixture. Whisk in eggs 1 at a time, then continue whisking until mixture is smooth and velvety. Add flour and whisk just to blend. Transfer batter to prepared metal baking pan. Bake brownies until top is just springy to touch and toothpick inserted into center comes out with moist crumbs attached, about 35 minutes. Cool in pan on rack 10 minutes. If necessary, press down on raised brownie edges to level top. Using the foil, lift the brownies out of the pan to a wire rack. Cool completely. Bring cream and orange peel to simmer in heavy small saucepan. Remove from heat. Add chocolate and whisk until smooth. Whisk in 1/4 tsp vanilla and Grand Marnier. Refrigerate until thick enough to spread, stirring occasionally, about 45 minutes. Spread topping over brownies. Refrigerate until topping is cold, about 1 hour. Using a hot knife, carefully cut the brownies into squares. Let brownies stand at room temperature 30 minutes before serving. Whew.... these tourists were tacky!!! Yeah...those Butterfinger Balls are on my holiday baking list for sure ;)! Leave the insides and change the decor on the outside and should be good to go! 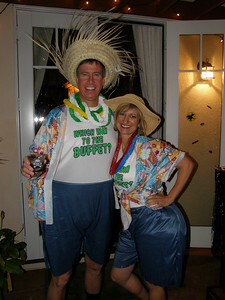 Cute costumes too...no party for us this year. We went to BIL's house and watched The Exorcist...SCARY! We went to an annual neighborhood party, and the Grim reaper, Beetlejuice, Chilean miner and mistress, (that would be my husband and I) Dr and Nurse, and a go go dancer with white go go boots, were some of the people at out neighborhood party. I made a graveyard cake, pumpkin dip, and Crazy snack mix. Your treats look spooky, but I'm saving the Grand Marnier Brownie bites for Christmas! What a fun party. I was home glued to the baseball game! Wendy, those balls were amazing!!! Without the glitzy gel they would look really pretty. Becky, those bites have been a favorite for years! I always cut the edges off to make them perfectly square and I end up eating them! Sara, LOL on the chocolate! Yep... Grand Marnier always helps! Judy... Woo Hoo!!! They did it!!!! Thanks Sarah! We had a really good time. 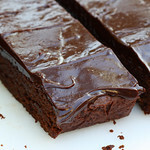 Those brownies were worth another mention, there are still on my to make list! Love those eyeballs, never seen them before! Looks like so much fun, wish I had neighbors like that! Wow! Awesome costumes and awesome treats! Love it! Ok you're not helping. I get done exercising and I see tantalizing treats! You know I have a sweet tooth...your costumes are priceless. How funny! It sounds like everyone was so creative. The sweets look so spooky especially the fingers. You must have had a really good time there. all of them look amazing! They all look awesome, Kim, but I'd be sitting by the tray of grand marnier brownies, not letting anyone else near them so I could gobble them all up! Your brownies look wonderful and it sounds like you had a fabulous time. 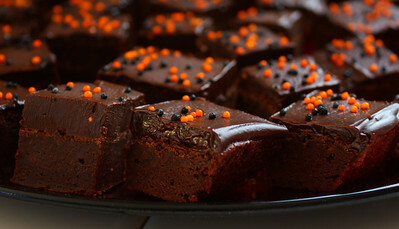 Those are the fudgiest looking brownies...perfection in a pan. Looks like you also had your share of Halloween fun. Love your costume...but mostly love all the Halloween treats. 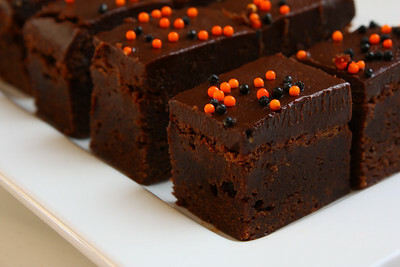 The brownies are to "die for" so gorgeous and yummy. Very creative stuff. Kim-I will be putting you on my "lovely blog award list" to nominate you too. I have 30, since I got 2 awards, and only responding now to the first one as well. It was a little complicated for me to remind myself, since you are not on my blog list...and you are not following my blog! I am seriously drooling over these brownies. This is a serious chocolate overload--love it! Holy kitten caboodle, Kim! What amazingness you created! These all look wonderfully fantastic and I'm definitely going to be trying some of them out! The eyeballs and fingernails are outrageous! I've never really thought about doing something like that... perhaps because I don't think about fun stuff due to school, haha. Thank you for keeping me young with your awesome posts and sharing! And the Grand Marnier Brownie Bites? Totally doing that for the upcoming holidays :-) Always looking for great reasons to invest in another bottle of liqueur! Oh, and major happy birthday to your pops; I'm glad y'all had a lovely time together! Wowowow, this all looks so spooookily delicious! We went to a party Saturday, but there wasn't a single thing I'd want to show a picture of... lame! And I do so love Grand Marnier, so the brownies look extremely delish. Thanks! Brownies with grand marnier, now we're talking! No party for us this Halloween! Kind of a bummer, but your costumes look so cute and these treats look to die for! Your brownie bites look fantastic and sooooo yummy...!! Congrats Kim on Top 9 today! Way to go. Congrats on the top 9...such a beautiful photo!!! never really like halloween as a kid, but now that I have kids i really kinda dig it! Love making the special treats for them....have to bookmark your page for next year....beautiful photos too...mine are work in progress! Those all look so good, I'm going to try them! Congrats on the Top 9! The brownies look amazing and it looks like you guys had a fabulous time. Wow, I wish I did attend to that party! Looks like a lot of fun – and not to mention – so many tasty things to eat. Yummy. Your brownies look great. Thanks for sharing. Kim - so cool!! Sounds like a fun party and the treats were amazing. Your brownies look like they are to die for! Congrats on being #1 in the Top 9!! I need those brownie bites in my life ASAP. End of story! They look sooo gooooood! Oh my, those brownies are to die for! Sooo sinful...all mine! The fingers really look good and creepy. What fun! Yummmmm! Fabulous job!!! Grand Marnier Brownies??? Brilliant!! 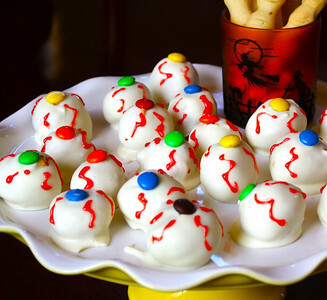 Really awesome Halloween treats! I think my fave are the Brownies. Your brownies look terrific. And chocolate and Grand Marnier are wonderful together. I thought you might be interested in seeing the really tempting gluten-free brownies I just posted--most people can't really tell they are gluten-free, so they are good for serving to anybody, not just people who have gluten allergies. wished I had see this first, I made the eyeballs with powdered donuts yours look so much better thanks for the idea next year! OMG this looks amazing!!!!! Glad you had a great Halloween!! So I am STARVING now. I can eat all of that for breakfast. Your friends are so lucky to know you. Kim, all of these look fantastic. But Butterfingers...YES, please! I'm glad you surfaced this post again or I'd have missed out. Thanks and Happy Haunting!